These are my three water pots. 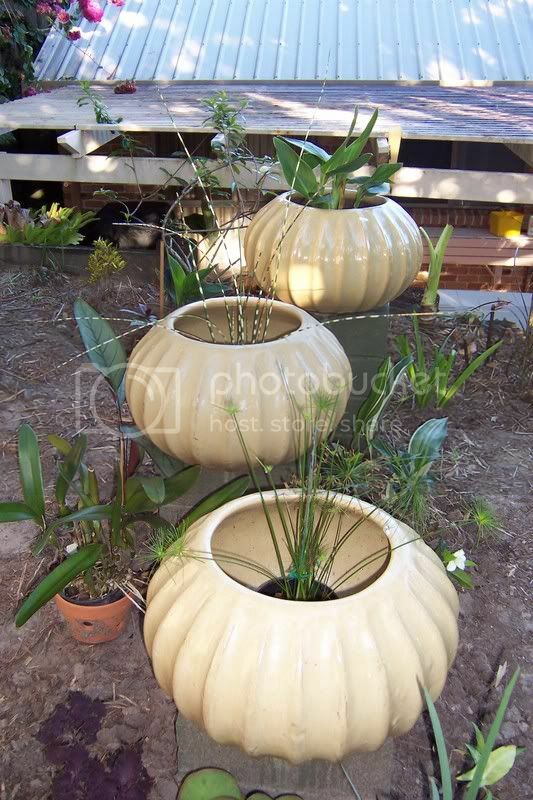 They hold some water in the pots and are designed for bog plants. I should post my bog pot and give you all a laugh. It's one of those big recycled plastic tubs, and it was only meant to be temperary, but it's been sitting in the sun so long it's starting to fall apart. Not a good look. Yes, they are very nice pots. I like the middle plant...stripey looking..do you know the name, Marleneann? Thanks. midgin wrote: I like the middle plant...stripey looking..do you know the name, Marleneann? Thanks. I don't know the name ...but was told it was the Didgeridoo plant ...or grass. If anyone knows for sure please let me know. Thanks. GE has it in their catalogue, but it says it's not available, Midgin. I'll send off a message and find out when it will be.